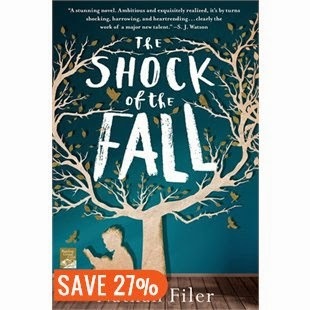 This month's book club selection was The Shock of the Fall by Nathan Filer. To start with, this book is so sad. I read it on the plane down to PEI and back. For some reason Dave and I were not sitting together on the flight down and I chatted with the man next to me before I started reading. At one point I had to put the book down, and when I stopped reading he asked how my book was and my response was "It is so sad! I can't even read it". It was a very engaging read however so I couldn't stop reading for long. I read it on the way back and almost finished it, so it is a very quick read too. Two of the major themes of the book really got to me - a family dealing with loss, and mental illness. The writing captured a very authentic narrative so that you could understand the characters' emotions and reactions even if you've never dealt with these scenarios personally. You can see what happens when bad things happen to people, how that can change their entire lives, and how they can try to "just get over it" but how that is actually very difficult. This is a great book, with fabulous writing and engaging characters, but you have been warned - grab the Kleenex and maybe avoid reading it in public. I wrote about mental illness here.